You Are Here: Home » Local News » Play ball!! The expensive controversial new home for the Marlins is truly a “Diamond” of a gem for Miami. This is a must see destination for the ardent lovers of Miami culture. Whether you’re a huge baseball fan or not, this stadium is a mandatory “Stay-Cation” visit. It sits in the refurbished home of the old Orange Bowl. This stadium turned out to be a grand production. There is no doubt the experience of Marlin stadium will blow you away. It is set up with an opulent view of Downtown Miami from almost every seat. Now that it has a retractable roof the atmosphere is perfect any day of the week. I would suggest you might want to take a sweater. They keep the air conditioning at a comfortable, but crisp 72 degrees. The access from I-95 south bound has great signage all the way to the ballpark. Plus the parking in the stadium lot is so convenient, you will not ruin your day with any hassles. At the Mets game I went to, it was disappointing to see the dearth of our readers in attendance. Out of crowd of 18,000+ I could only count 11 people that looked like myself. Let me strongly encourage you to take advantage of one the most dynamic major league ballparks in America. The best part is that it’s located right here in our backyard. 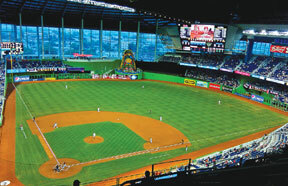 An outing to Marlins park will be a memory your kids will share the rest of your life. The ticket prices start at a reasonable range. Plan in advance and you can take the entire clan for under $100. Seeing a major league baseball game is a slice of Americana pie. Not to mention the team under manager [“Donny-Baseball”] Don Mattingly is displaying a lot of grit. They beat the Mets with a walk off home run the day I went. Go support the “Fish”. The kids will love you for it!